VINTON, Iowa – New season, new look. The new IMCA Speedway Motors Weekly Racing logo was unveiled today. Incorporating the new Speedway Motors logo with the familiar red IMCA logo, it will appear on decals to be mailed in 2019 drivers’ packets for all eight divisions. The new logo will also accompany many of the releases posted on the IMCA website and published in the IMCA newsletter. Speedway Motors is the longest tenured IMCA sponsor, as part of a business partnership that dates to the 1950s. The Lincoln, Neb., speed shop, founded by ‘Speedy’ Bill Smith and his wife Joyce in 1952, has paved the road for drivers for the past 67 years through innovation, grit, and good old-fashioned heart. 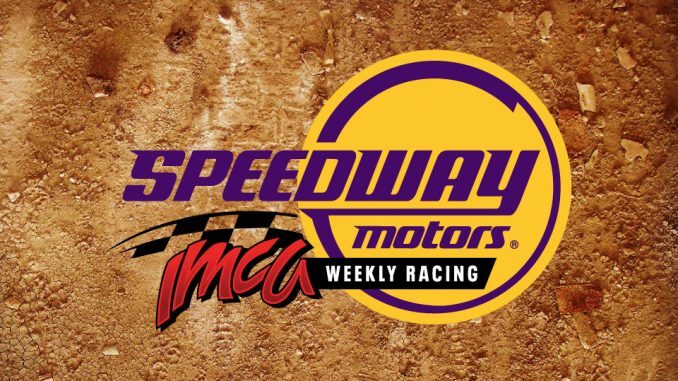 Now the world’s largest manufacturer, distributor and retailer of street rod, muscle car and racing products with 400-plus employees and a 500,000 square foot facility, Speedway Motors marks its 12th year as title sponsor of IMCA Weekly Racing and 24th year as title sponsor of the IMCA Super Nationals in 2019. From day one, the business was a family affair and a business built with a passion for cars and speed shared by Bill, Joyce and their four sons, along with their customers and fellow enthusiasts, racers and gearheads. Bill and Joyce’s sons are continuing the family tradition of hard work and dedication to the company and all have a role in the daily operations of the business. Jason, the youngest Smith brother, says he used to spend his days working at Speedway Motors for a grape soda as a kid. Today, he shares the same passion as his father and is looking forward to what lies ahead. “The future is so bright for our company. We continue to offer our customers great products at great prices, and we have the experts on staff to help them install those products the way they should be installed so they’re safe and they perform the way they should,” says Smith. With their ambition, the Smith brothers and their employees know that Speedway Motors can keep up with the innovation of the automotive industry while also staying committed to all classic car lovers across the globe. Speedway Motors is dedicated to making the dreams of its customers come true when it comes to style and performance. Each driver can express themselves and feel confident that everyone at Speedway Motors is cheering them on from the sidelines. And you couldn’t ask for a better pit crew than the Smith brothers who have turned their father’s dream and their mother’s $300 into a lasting legacy.